Ever since The Strangers terrified audiences back in 2008, horror fans have been begging for a sequel. Now, ten years and a bunch of false starts later, The Strangers: Prey at Night is finally here. The Strangers: Prey at Night is about a couple of parents named Cindy and Mike (The Neon Demon‘s Christina Hendricks and The Ring‘s Martin Henderson, respectively) whose daughter, Kinsey (Bailee Madison from Don’t Be Afraid of the Dark), is a problem child. They decide that the only answer is sending her to boarding school, so with their son Luke (Lewis Pullman from Battle of the Sexes) in tow, they set off driving her there. It’s a long drive, so at the halfway point, the family stops at a trailer park that is run by some relatives. There, they find themselves stalked by three eerie masked psychopaths (Emma Bellomy, Lea Enslin, and Damian Maffei) who seem to have targeted the family for their murderous game. The Strangers: Prey at Night was written by Ben Ketai (The Forest) and directed by Johannes Roberts (47 Meters Down, Storage 24). Original writer/director Bryan Bertino also draws a writing credit, since The Strangers: Prey at Night pretty much follows the same basic plot as The Strangers. Unfortunately, whereas The Strangers was a pressure cooker exercise in tension and suspense with short, unpredictable bursts of sheer horror, The Strangers: Prey at Night devolves into a standard, run-of-the-mill slasher once it gets past the setup. Which would be awesome, if this were 1984. It’s not, so The Strangers: Prey at Night doesn’t really bring anything new to the table. For what it’s worth, director Johannes Roberts has done his homework and for a retro-slasher, The Strangers: Prey at Night is not a badly made movie. He even tosses in visual quotes and nods to everything from The Texas Chain Saw Massacre to Christine. But, instead of going for the nostalgia factor (even the soundtrack features eighties hits), Roberts should have concentrated more on character building so that the audience actually cares about the family and whether they live or die. The victims in The Strangers were, although flawed, highly relatable characters, so the audience felt every slash and stab with them. 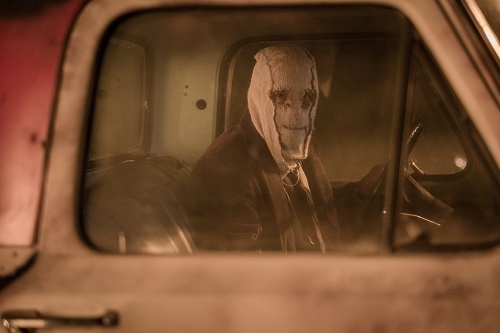 The backstory in The Strangers: Prey at Night is also sympathetic, but the actors don’t sell their situation as well as they should, so their plight seems phoned in. By the time the preying starts, the audience is actually rooting for the killers. I have to go on record as saying that, for me personally, The Strangers is one of the best movies of the 21st century, so my bar may be set a little (or a lot) higher when judging a sequel. But I really wanted to like The Strangers: Prey at Night. And who knows? Maybe if it had a different title and the psychopaths wore different masks, I’d like it more. But, as a sequel, The Strangers: Prey at Night does not live up to the legacy of The Strangers. Music was an instrumental part of the original The Strangers, and it’s a big part of The Strangers: Prey at Night, too. However, whereas the diegetic soundtrack to The Strangers was full of haunting songs like Merle Haggard’s “Mama Tried” and Joanna Newsom’s “Sprout and the Bean,” The Strangers: Prey at Night features eighties songs like Kim Wilde’s “Kids in America” and Air Supply’s “Making Love Out of Nothing at All” that don’t quite have the same emotional resonance. They serve the same narrative purpose, but don’t have the same impact. The songs are too familiar to be creepy. The musical score, composed by Adrian Johnston (Becoming Jane, I Am Not a Serial Killer), also sounds familiar, but only because it’s a typical retro-horror synth score, with a sound that falls somewhere between classic John Carpenter and modern Joseph Bishara. It’s serviceable, but it sounds like all of the other It Follows/The Neon Demon eighties clone soundtracks. There are only a handful of real scares in The Strangers: Prey at Night, and that’s a shame. Because the original The Strangers not only scared the hell out of its audience in the theater, but it burrowed into its psyche and followed it home, hiding behind its curtains and slipping under its bed. There’s none of that paranoia or anxiety in The Strangers: Prey at Night. Aside from a few jump scares, half of which are cheap red-herrings, there’s nothing to fear in the movie. Maybe it’s because the killers get too much screen time, or maybe they just have too much verbal interaction with their victims, but Johannes Roberts has managed to take three of the most enigmatic and mysterious characters in modern horror history and sterilize them. And that takes all of the horror out of it.